This week I was featured on a joint collaboration between Paula Deen and Kraft- an online publication called Live Richly. A new venture, part of their Real Women of Philadelphia efforts, they’ll be promoting a blogger every other Thursday in a feature called “Build a Better Blog.” I was honored to be the first blogger they spoke with and love the finished product. I was also really touched by the kind words that were left on the Q&A and would like to welcome new readers! We’re happy to have you joining us! In the interview, they marked my answers with the name biscuits. Since it went live yesterday half the Museum staff and a few family members have decided this is the perfect nickname for me. With the exception of my life-long nickname, Enie (given to me by my cousin Taylor, five days my junior, who couldn’t pronounce Elena), I’ve never had nicknames. So I’m a little excited about this development. At the beginning of last month a reader asked if, after we were done with the pie craze, I could do a 101 on biscuits. In the past with things like burgers and steak we’ve done tutorials at the request of readers and so I was glad to get this one, particularly as biscuits are kind of our thing. 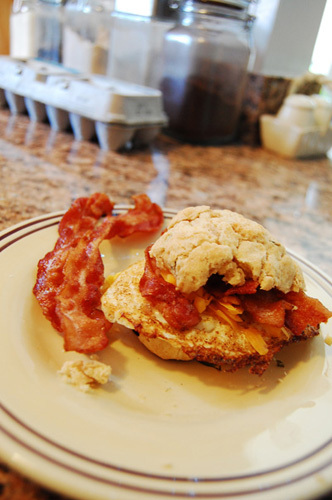 Okay, pie is kind of our thing but “biscuits and such” had a better ring to it, way back when. 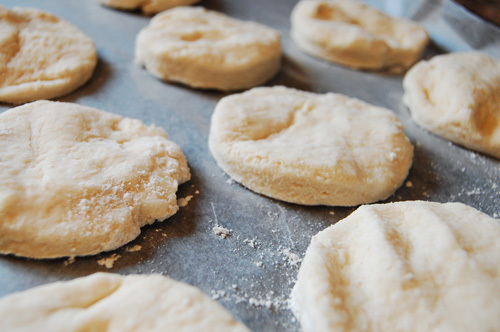 The key to biscuits, as with any dough, is getting the fat to flour ratio right. All of the ingredients are important, but you won’t get the flaky, delicious layers unless you treat the butter just right. Which brings me to my next point, which is that while I have used vegetable shortening and lard in biscuits before, I prefer a combination of butter and heavy cream. 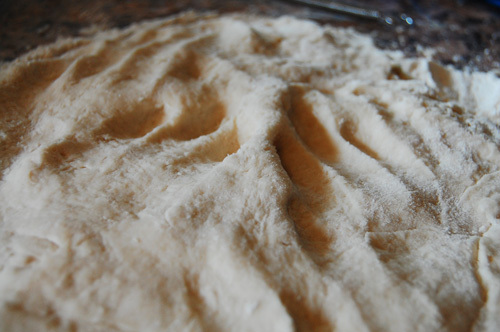 I also use a combination of pastry flour and self rising flour, and both baking soda and baking powder. 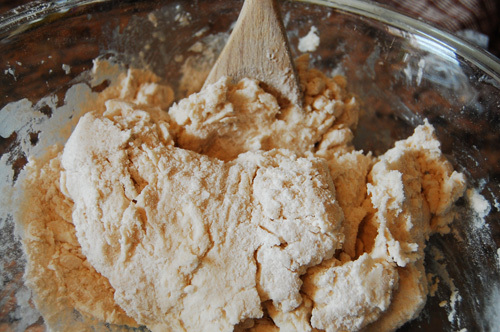 To start with biscuits, you combine your dry ingredients. Whisk (which will lighten the flours) together 1 1/4 cup self rising flour, 3/4 cup pastry flour (or cake flour), 3/4 tsp baking powder, 1/8 tsp baking soda, 1/2 tsp salt, 1 tbsp sugar, and any herbs/spices (like rosemary or green onions) that you’re interested in adding. Whisk all the ingredients so that they are light and fluffy. Now it’s time to add your butter, which should be COLD. Cube four tablespoons of butter and, using, your fingers, work it into the flour. I like to smooth the butter out into long, thin pieces. This way, when you press the dough out later, it forms layers of butter between the flour, which is what makes the flakes. Work the butter quickly so that your hands don’t warm it too much. Next, it’s time to stir in 1 1/4 cups heavy cream. Stir it in with a wooden spoon, bringing together all the ingredients until they form a rough ball. 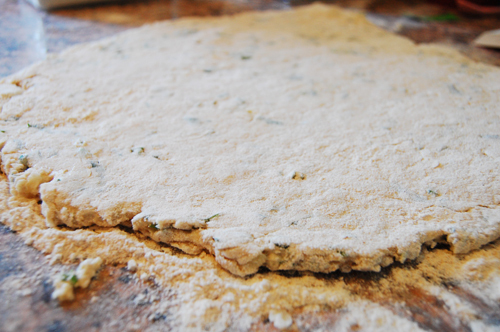 It should be on the sticky side as it is always easier to work more flour in than it is to fix a dry dough. 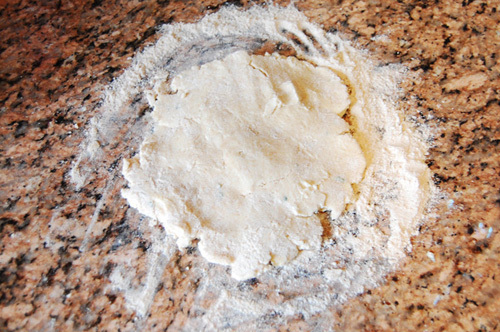 Sprinkle a little all purpose flour on the countertop and dump your dough out. 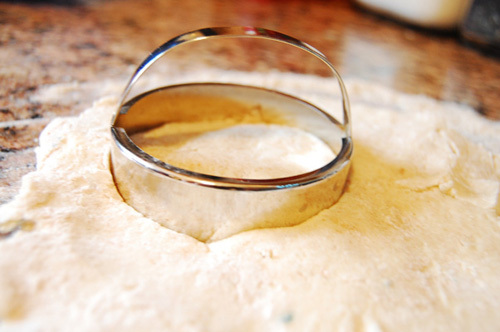 Using floured hands gently press the dough out flat. I like to work it a little at a time, working it out and then flipping it so that no one area or side gets too worked. Continue to press it out until it is 1/2″ thick. If at any time it starts getting sticky, pop it into the fridge for 20 minutes. Now it’s time to cut the biscuits. You’re welcome to cut them free-form, with cookie cutters, a glass jar, or a proper biscuit cutter. As long as they end up portioned, it doesn’t matter. Heat your oven to 475, cut them into shapes, and place them on an ungreased pan. The last thing you want to do before baking is give them a glaze. I like to take the measuring cup that I used to measure out my cream, stick 2 tbsp of butter in there, and melt the butter in the microwave. Then I brush the butter/cream on my biscuits. Bake for 10-12 minutes. 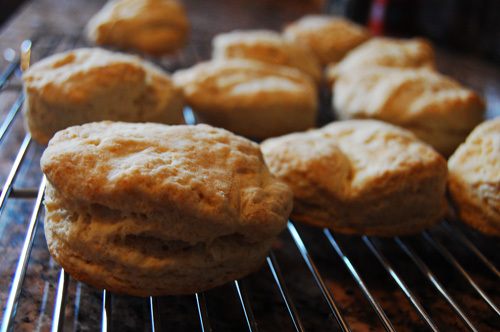 As they bake your biscuits will rise into delicious, flaky treats. Control yourself and let them rest for 10 minutes before you cut them (any sooner and they’ll crumble). After that they are the perfect vessel for jam, butter, a spicy chicken filet, or bacon egg and cheese. 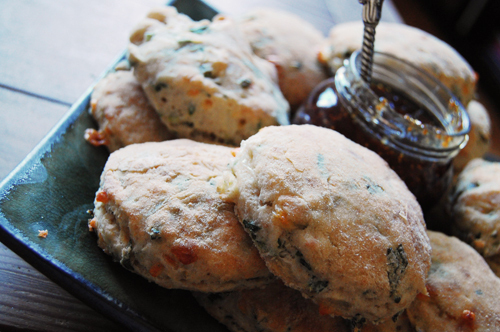 Or you may simply indulge yourself with a perfectly wonderful biscuit. Enjoy! Congratulations on the Live Richly feature. Since Pie Month has come and gone, when is Biscuit Month? I love biscuits! <3 I can totally relate to being so far away from the south as I am on the other side of the country from my hometown, Mobile, AL. They look delish! Did I miss something, or does the recipe not specify how much butter to use? Please let me know as I want to make these ASAP!! Good catch, Natalie! You want to add 4 tbsp cold butter. Spot on with this write-up, I actually assume this web site needs way more consideration. Iâ€™ll most likely be once more to learn way more, thanks for that info.